Last March I spent my birthday with a group of women at a Retreat center in northern Ohio—a beautiful, former girls school turned nunnery turned sanctuary. There our hearts were primed to hear God’s voice. Each morning I led the women in lectio divina. We walked a prayer labyrinth on the property and prayed under birdsong mingled with the voices of tall, limber pines singing in the wind. When the time came to give my message, I was changed. I felt close to these women—safe—and God kept nudging me to give a different message than the one I’d prepared. I felt the urging to share more deeply and allow myself to be vulnerable. So I did. In the context of scripture, I shared the story of a difficult experience my family had just been through. Something that had caused great pain that still touches us in many ways. And as I was speaking the words out loud, something so surprising happened. I felt a sob well up in my throat and there was nothing I could do to suppress it. I had never spoken this story publicly and my emotions took me off guard. But when that sob escaped, something beautiful happened. Every eye turned unblinkingly upon me. The tears had captured their attention. After all, this is something they all understood so well: sorrow; grief; the deep soul disappointment that life hands us sometimes. I looked out over the faces of the women I was speaking to and I saw only love. After a time of worship, as we clustered in small groups sipping coffee and nibbling sweets, woman after woman approached me. In hushed tones, they shared similar stories of darkness. Times of despair and pain. With few exceptions, these women told me how they kept their pain a secret, held it tightly to their hearts, locked behind cut-flower words and plastered on smiles only gum-deep. My heart broke as I listened and the realization sunk into me: We do not feel safe to share our pain, our brokenness—our humanity—in our churches. I remembered my time at that retreat this morning when, in my quiet time, I read Psalm 31. Eugene Peterson says the Psalms are where we go to learn our language as it develops into maturity, as it answers God. The Psalms are fraught with humanity, giving breath to a plenary human experience. This particular Psalm is often used as part of the lectionary on Palm Sunday. It’s a typical lament; a cry for help and complaint that moves through petition and toward a statement of trust and praise. In fact, a large portion of the Psalms could be categorized as lament. The estimates are from one third to one quarter of the Psalms falling in this category. But that word? Psalm? The Hebrew word for Psalm means “praises.” Does it seem odd to you that a book of praises would hold so many laments? Or do we need to change our definition of praise? And why is this Psalm often chosen to companion Palm Sunday? It certainly lends very little triumph to the triumphal entry. But what it does do is boldly hold that tension that often so colors the human experience. A lament does the unthinkable—it holds anguish and hope side-by-side; revealing the depth of the nature of human life. Allowing the humanity of Jesus to call out to our own humanity. When I read the story of the Triumphal entry, I cannot help wondering what was going through Jesus’ mind as he wrapped his legs around the soft underbelly of that donkey, the noise of the crowd ringing in his ears. He knew what he was going to. He’d already tried to explain to his disciples on two different occasions that he was going to his death. No heavenly army swooping in, no Roman defeat, no redemption of all the years of oppression his people had faced. What was he thinking? But do I? Behold the man? Too often I want to impose upon Jesus some kind of superpowers, but Jesus was a man. Fully God, yes, but fully human as well. How could one made of flesh and bone, one whose blood ran as hot and cold as ours, how could he withstand such horrors? How could he plead with God to take away this cup and still end by saying, “Yet not what I will, but what you will”? Jesus felt the full range of human emotions. Yet he was as close to the Father as any human could be. Anguish and hope held side-by-side. Lament. 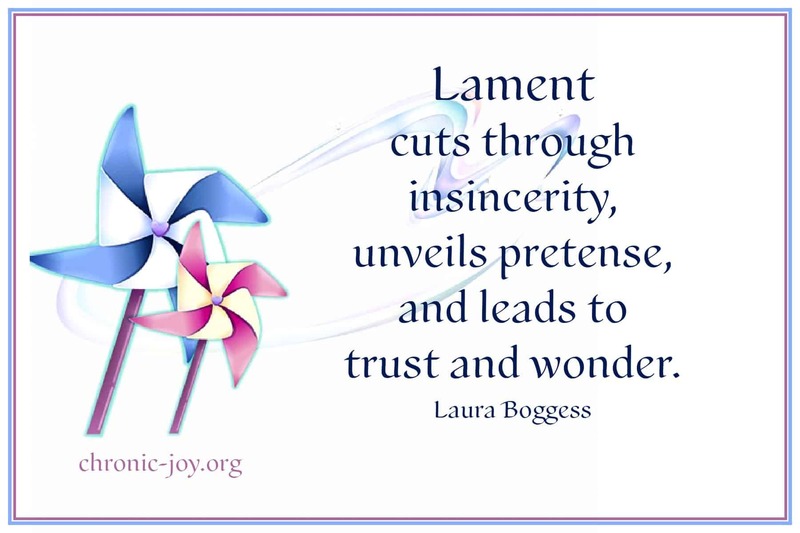 Lament cuts through insincerity, unveils pretense, and leads to trust and wonder. Because true worship involves bringing every aspect of our lives before God—not ignoring the hard stuff of life but worshipping in the midst of our struggles. Jesus prayed a portion of Psalm 31 from the cross: Into your hands I commit my spirit … Such a beautiful statement of trust. But don’t you wonder, if he had sung this Psalm before … don’t you imagine that the rest of the Psalm was on his mind as well? And the hard stuff comes after that sweet statement of trust. Jesus knew the power of lament. He knew the power of sharing sorrow publicly. To lament together is to allow the sorrows and joys of my brothers and sisters to be mine, and mine to be theirs. This requires me to stay awake to sorrow and to the struggle of my pain and questions of God. We can only lament when we fully trust, for lament opens the heart to wrestle with God and hold onto him through the pain—to allow ourselves to be touched by God, so that we will walk with a limp, but we will be named. After I shared that vulnerable message at that women’s retreat, one of the ladies who is an artist told us about the Japanese art of Kintsugi (or kintsukuroi). It’s a 500-year-old method for repairing broken pottery. You see, she said, in those ancient times, most families only had one good bowl or platter. If it was broken, repair was necessary. Over time, artisans began repairing the cracks with a special lacquer mixed with gold, so that a bowl highly valued by the family may have many gold-veined lines through it. The golden seams became a sign of value, instead of disrepair. The cracks, a vehicle to appreciate beauty in brokenness. The Psalmist says, “I have become like broken pottery.” As are we all. We are a flawed people living in a fallen world. But we have been healed with something far more precious than gold lacquer. We are washed in the blood of Jesus. But we remain in this in-between time—redeemed but waiting. Broken, but beloved. This is our reality: in this life, we will have troubles. We are free to weep before God, and one another. We are free to ask “why?” See, when we come to him with our sorrow, it is only then that He can hold us. It is only then that he can etch gold throughout the broken places in our lives. If Jesus did not shy away from lament, why should we? Let us weep together and rejoice. Because even in sorrow we have a luminous hope. Because we know death has already been defeated and one day it will no longer have its sting. Our times are in your hands, O LORD. Let your face shine on your servants, save us in your unfailing love. Amen. LAURA blogs at Chasing the Blue Flower, where she shares stories about faith, family, and chasing after God. 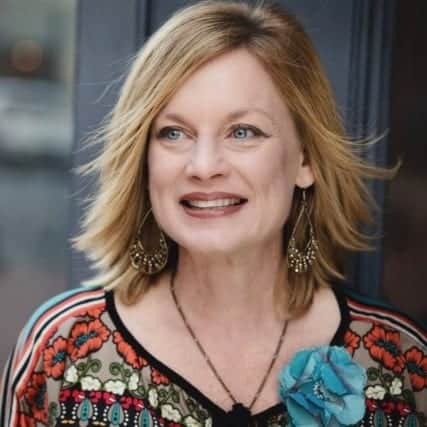 With a master’s in clinical psychology, Laura works in a medical rehabilitation hospital in West Virginia, where she resides with her husband, Jeff, and their two sons, Teddy and Jeffrey. Laura is the author of Playdates with God: Having a Childlike Faith in a Grown-up World and she collects moments of beauty on Instagram. So very true. I am so thankful that God opened my heart to explore Lament, through Chronic-Joy’s first book, “Discovering Hope.” But it is so true that lamenting continues through this life, as we walk through different trials. How very precious that God has given us the Psalms as a place to see His hope intermingled with the very heavy grieving. May my heart continue to cling to Him there. Thank you for these beautiful thoughts!